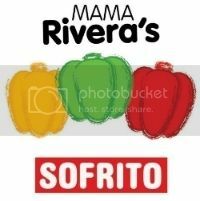 Healthy Latin Eating » Camarones al Sofri-Yaki! / Recipes / Camarones al Sofri-Yaki! Seafood is one of my favorites but going out to seafood restaurants can be pricey. I try to make easy dishes that can be ready in almost the same amount of time as if ordered in a restaurant. The payoff is great food at a great price plus I’m in control of the sodium and other ingredients that go into it. Shrimp are so tasty and so fast and easy to cook, its one of the items I make sure I have in my freezer at all times. This particular dish is so yummy that you can mix with a salad, add to your pasta, or place in a platter with toothpicks as an appetizer (as I did for Super Bowl Sunday). I’m usually short on time and last-minute so I don’t have the luxury of letting stuff marinate for long. I need it to get instant flavor. Sofrito is so rich and pure, I don’t need much else. I also like this brand of teriyaki sauce because unlike others I’ve used, the sesame seeds are already in it. It gives it that little extra consistency. With minimal ingredients and time, you can create a crowd pleaser. Preheat oven at 400 degrees. Sprinkle Olive oil on baking sheet (about ½ Tbsp.). Mix all other ingredients in bowl and toss to coat evenly. Arrange shrimp in a single layer in baking sheet. Bake in oven at 400 degrees for 10 minutes. Toss to mix and broil at 350 degrees for another 7 minutes. Remove from pan and serve.